Candy body coated with sugar fondant with banana flavor. 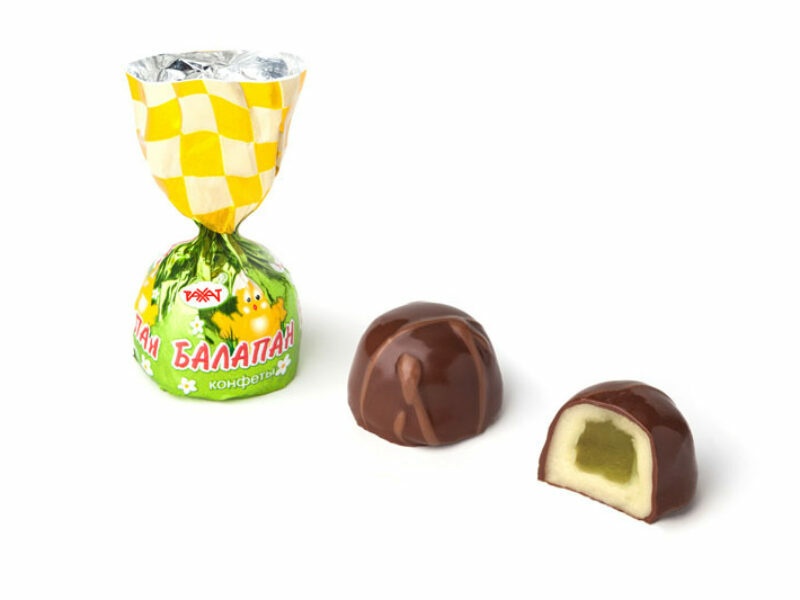 Filling made of transparent jelly with delicate flavor of green apple. Ingredients: sugar, glucose syrup, cocoa mass, fruit sauce, cocoa oil, water-holding agent – sorbitol; vegetable fat (palm oil), ethyl alcohol, cocoa powder, gelling agent – agar; whole milk dried, whey solids, neutralizer – citric acid; emulsifiers: soy lecithin, Е476, Е492; common salt, stabilizer – invertase; aromatizers are identical to natural, antioxidant – NovaSOL COF (tocopherol E307); food colouring agents: curcumine, Е141. Storage life is 8 months.